A study published earlier this year and presented at the American Academy of Dermatology’s 74th Annual meeting showed alarming concerns for Black women. The study showed that Black women were more prone to hair loss and even more concerning was the fact that we are less likely to seek professional help to rectify the problem. The cause for most of the hair loss for black women is a condition called Central Centrifugal Cicatricial Alopecia (CCCA) which is a disorder that causes inflammation and destruction to the hair follicles-- it can cause scarring and even permanent hair loss. This vital and alarming information was provided by Dr. Lenzy, a Board-certified dermatologist and clinical associate at University of Connecticut, Farmington, Conn.
Dr. Lenzy, along with other experts believe hair loss is a genetic disposition among black women and they are increasing the risk of hair loss by practicing damaging hair styling techniques like braids, chemical relaxing, and wearing weaves. Out of 5,594 black women who were part of the study and survey, almost 50% reported hair loss on the crown of their head and 81.4% of those women never sought any kind of help from a physician or dermatologist. What to do? How do we end the cycle? We see the problem and we know it is not getting addressed by the individuals suffering from it, so what should be done? 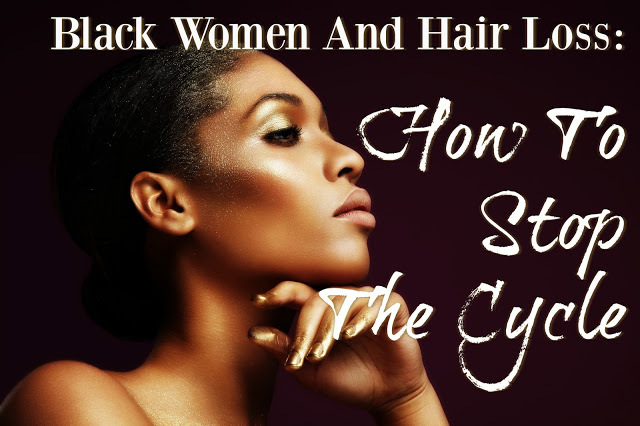 Of course, education is always the first out of the gate for answers as it is obvious many of the Black women dealing with hair loss are not getting help. Sure, we see videos here and there discussing some women going to salons and getting help but usually it is just covering up the problem. These women need real solutions and while it makes sense to seek out a hairstylists, seeking medical help first ensure you know exactly what the problem is so you can properly address and rectify. Suffering in silence will not solve the problem nor will it help. Covering the hair loss or thinning hair up with wigs, weaves, or braids is not the answer either. Often that can compound the problem and make already damaged hair worse or can even negatively affect the scalp to the point of irreversible hair loss. Seeking medical help from a dermatologist, trichologist or a physician can help determine scalp damage or illnesses that may be causing hair loss. They can also get you back on track to healthy hair and scalp. These styles that are causing tension need to be stopped and I consulted with celebrity hairstylist and ambassador for Women’s ROGAINE®, Jill Crosby on hair loss. This is what we need to be talking about more as black women are feeling alienated. These problems are not being addressed as often as they should with real experts explaining what the problems are and how to fix them. Most women will suffer some form of hair loss or hairs thinning in their lifetime but black women are finding it through hair styling choices which are detrimental to their hair and scalp. You are not alone nor should you feel ashamed but rather, empowered with the information on what is going on and how to fix it. We can stop this cycle by knowing there are options for styles and treatments. Are you suffering hair thinning or hair loss and how have you tried to fix it?